The C40 Command Bridge was introduced by this legendary Wisconsin-based boat builder coinciding with the company’s 60 year anniversary. During those 60 years Carver Yachts has earned a reputation as a leader in building reliable, high quality, innovative cruising yachts. The C40 takes its place among the company’s new line-up of revolutionary yachts that has been redesigned from the keel up. Ranging from 34’ to 52’ in both express style coupes and command fly bridge models each yacht has been newly designed to meet market demands. The styling is fresh and modern, offering a new industry leading take on design while maintaining Carver’s classic focus on space and functionality. The C40 has caught the attention of discerning boaters everywhere by delivering on all the features one would expect from this experienced, high quality, world class yacht builder. 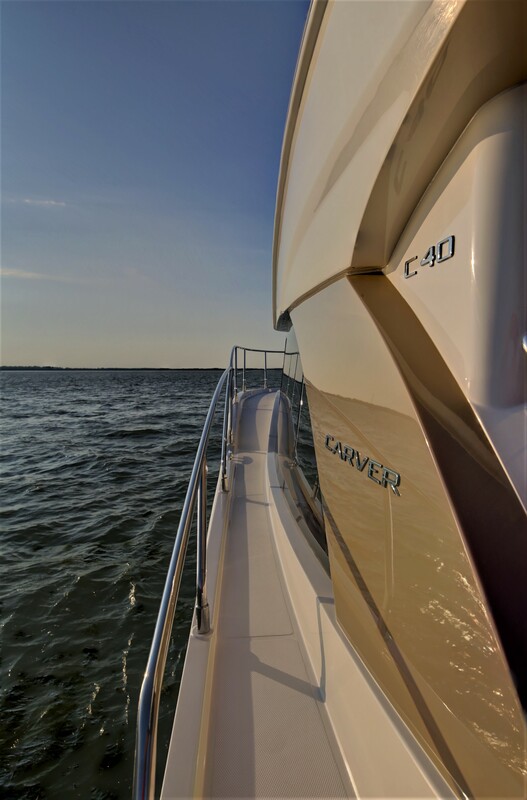 Like all Carver Yachts the C40 Command Bridge is built tough utilizing “Infusion Technology” along with an extraordinary stringer system that reinforces the bow as much as the bottom. That means less weight, more strength, and better performance! Carver’s manufacturing operation is unique in the industry, possessing in-house capabilities for components usually left to subcontractors. Craftsman produce cabinetry, upholstery and do metal fabrication in on-site workshops where the boats are built. 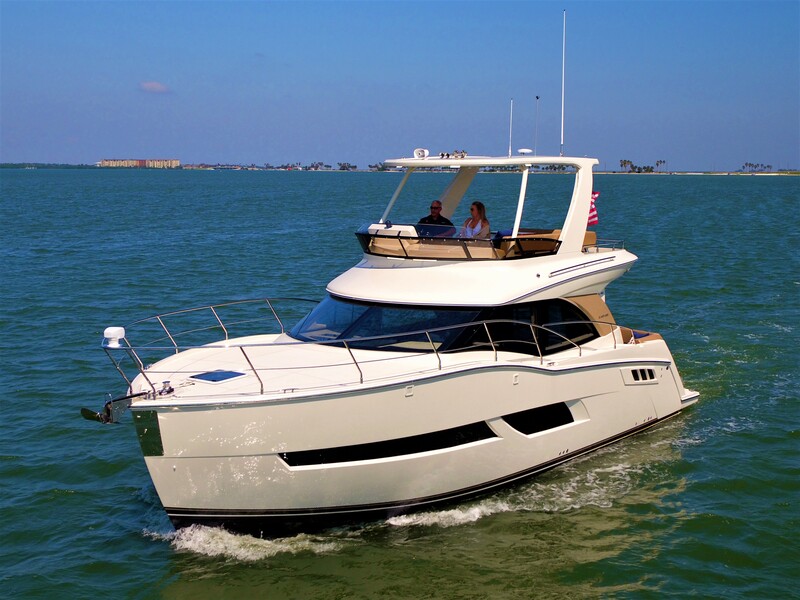 The standard propulsion configuration in the C40 offers twin Cummins QSB 6.7 380 HP inboard diesel engines with a top speed of 27 knots and a 280 nautical mile range at a cruising speed of 22 knots. Equipped with optional twin Cummins QSB 6.7 480 HP inboard diesel engines the top speed is 30 knots with a 275 nautical mile range at a cruising speed of 26 knots. A stainless-steel ladder allows easy access to a spacious engine room from the cockpit. Service, inspections, and maintenance tasks are optimized by placing all the through hull ?ttings, strainers, valves, filters, and switches centerline for easy access. 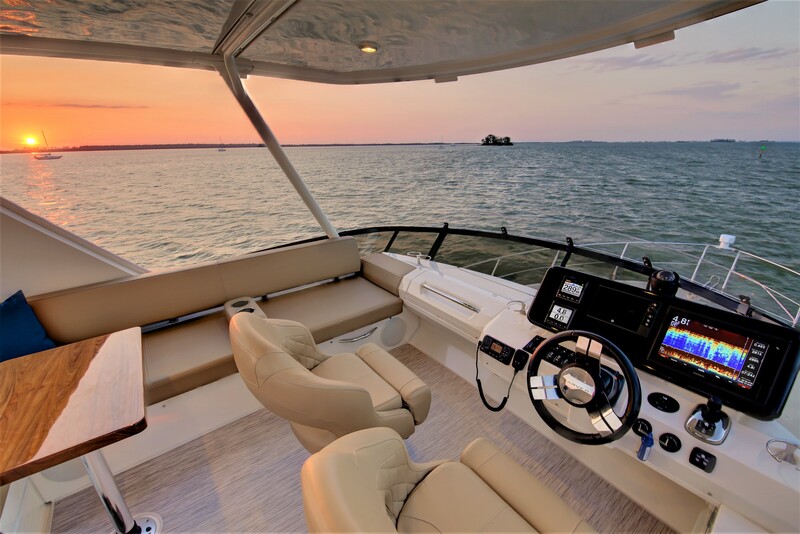 You will safely access the C40’s fly bridge and bow from molded fiberglass steps with angled lip, non-skid decking and sturdy, well-positioned 316L stainless-steel railings. These features allow you to move about the C40 comfortably with con?dence in any sea condition. Yachts in this class typically rely on open ladders that are almost vertical to access the bridge, which is not optimal. Another benefit of the molded stairway is the space it provides to install either a cockpit ice maker or refrigerator beneath. You also find the exterior light switch for overhead lighting, underwater lighting, and engine room lighting in this area. Two large, outward-swinging glass doors open seamlessly joining the expansive salon area with the aft cockpit. This inviting design allows the “outdoors in,” so enjoying a beautiful sunset while optimizing entertainment space is literally a breeze. This spacious, open, and airy design is one of the trademark features found on all the new Carver models. 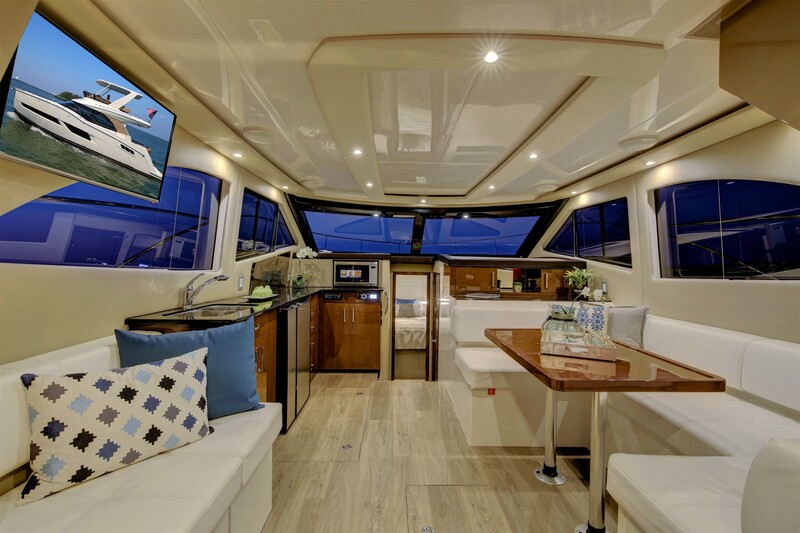 As for the C40, it’s accomplished with a 13’6” beam along with the two large glass salon doors and oversized windows complemented by a large, recessed ceiling panel featuring indirect accent lighting, wow features that you typically expect to find on a much larger yacht. 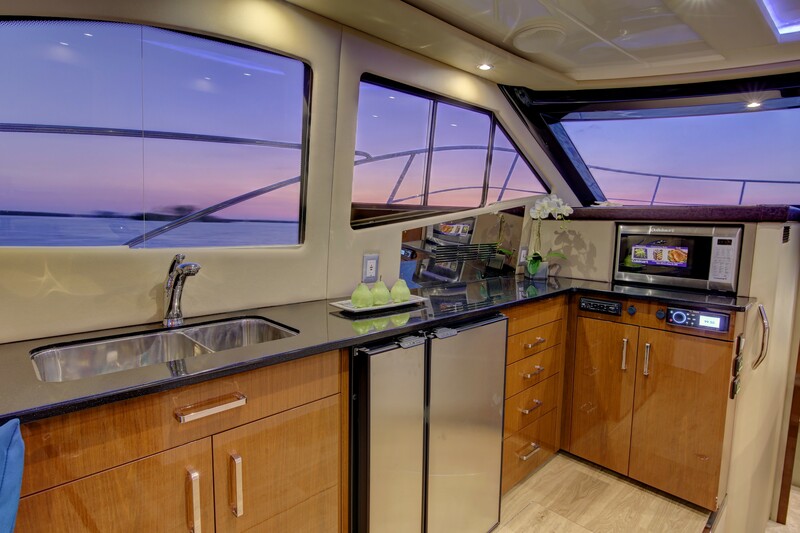 The galley is positioned along the port side of the C40 featuring recessed double sinks and stove to optimize counter space. 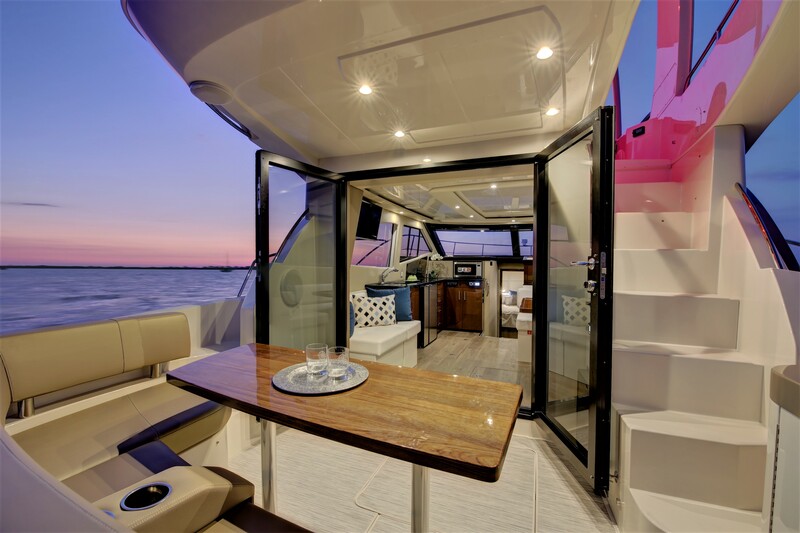 Its location is perfect when preparing meals for alfresco dining on the aft deck as well as serving the salon dining table. The portside seating by the galley is moveable to allow for additional seating around the gorgeous teak table. All the salon seats have large storage compartments below the cushions, you can never have enough storage! The C40 blends styling that is sure to turn heads on the water with the her impressive luxury, comfort and practical performance, all demanded by today’s discerning yacht owners.